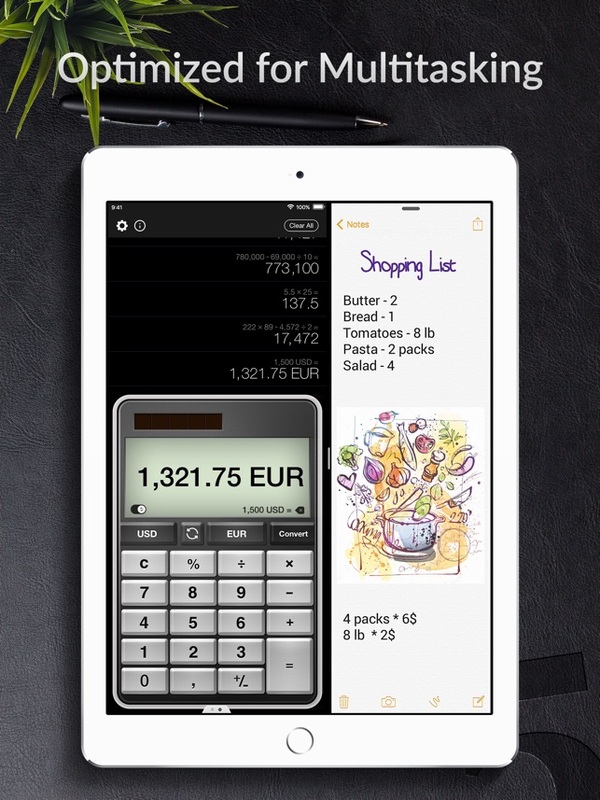 A simple calculator for your iPad with unit & currency converter and multitasking mode. Get it now for free! 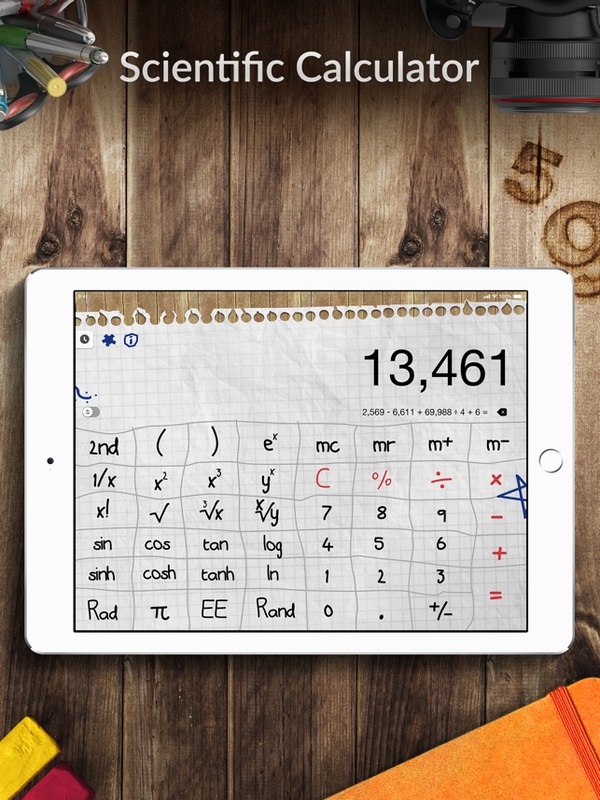 Calculator Pro+ for iPad is designed for everyone looking for simplicity and functionality. 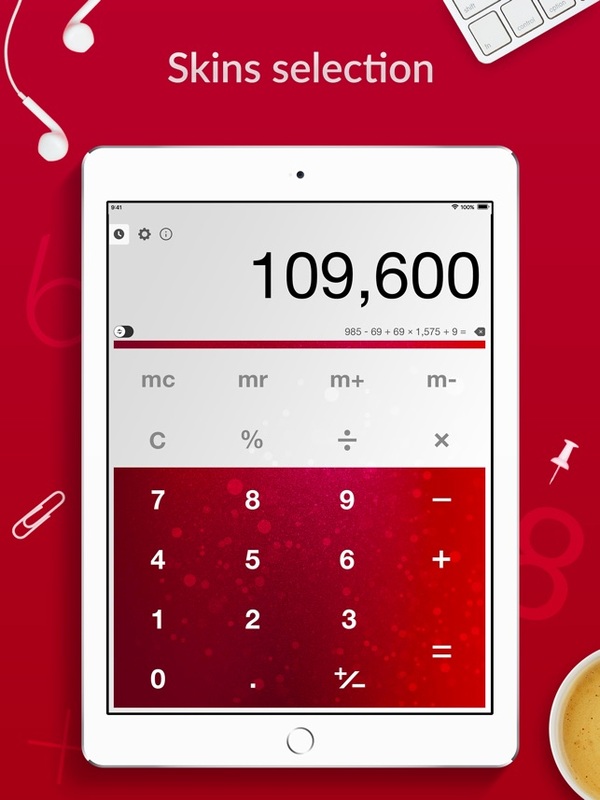 Enjoy basic calculations in Portrait Mode with big handy buttons, or make complex calculations in scientific calculator, available in Landscape Mode. 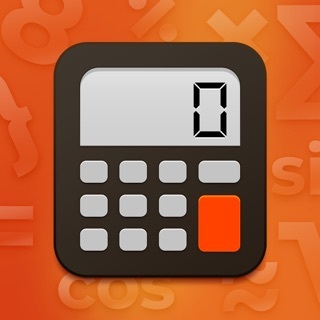 Calculator Pro is the only one calculator needed for math classes from primary school through college. The app is great in basic everyday calculations and solving complex problems in physics, astronomy or chemistry as well. Need to convert one unit to another? With the intuitive and beautifully designed converter, you can easily switch between currencies, temperatures, length, speed and other numerous units, and continue calculation without interruptions. 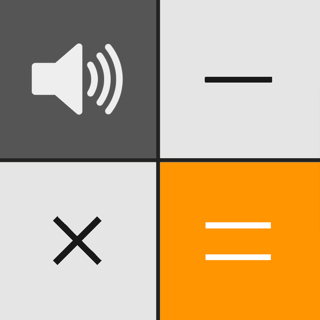 • Multitasking mode: bring in Calculator Pro while viewing web pages, photos, taking notes and more to get results instantly! 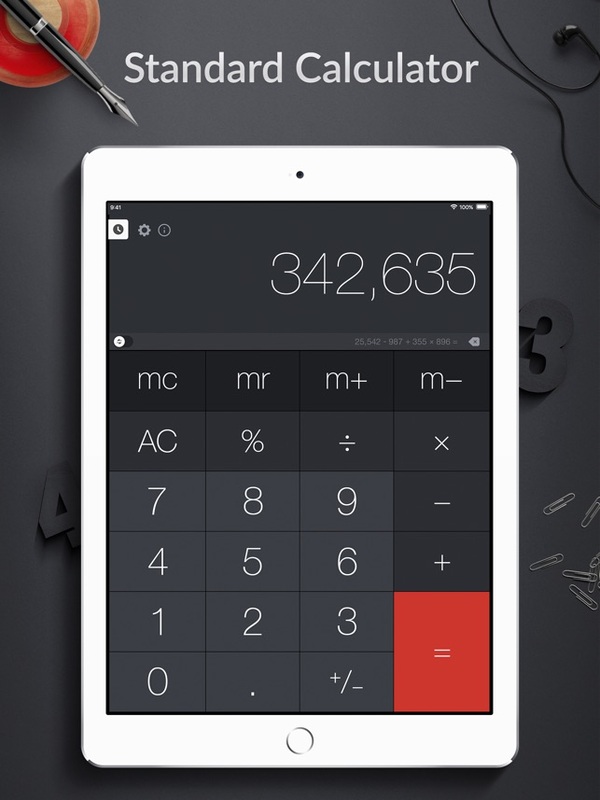 Now you can do calculations on the go seamlessly! *Location data - this will enable automatic currency selection in the Converter. - Performance and stability improvements for flawless work on iOS 12. I work in homes of clients doing construction and general contracting as well as on industrial job sites bidding big $$ jobs. I installed this calculator on my new iPad mini because I needed something on it to do little bids on this machine when I’m not using my iPad Air. Wow... it is garbage. Locks up after every keystroke because it’s trying to connect to its ad server, plays video ads constantly when connected to WiFi... I get thr need for a banner ad at the bottom that’s static (you did create the app for income, after all), but locking up because it’s priority is fetching ads before functionality of the app itself, where a dev thinks missing inputs from the client is acceptable while loading more ad banners instead of doing this function in the background... the dev obviously isn’t serious about the app and only cares about cranking in as much ad revenue as possible. If I was advertising online and saw my ad on your calculator I’d give my ad agency one chance to remove ads from crap programs like this or I’d fire them because the people who would be relevant customers would never use an app as broken as this, and I’d be wasting my PPI ad dollars on school children and people who didn’t have enough sense to check the App Store for any of the other 50 results for the search term “calculator” and download any other calculator app. At all. These functionality limitations and ads in the app are compensated by the fact that it’s free. Please consider checking our portfolio for the applications with no ads that are available for download on different terms. Sorry for the inconvenience. 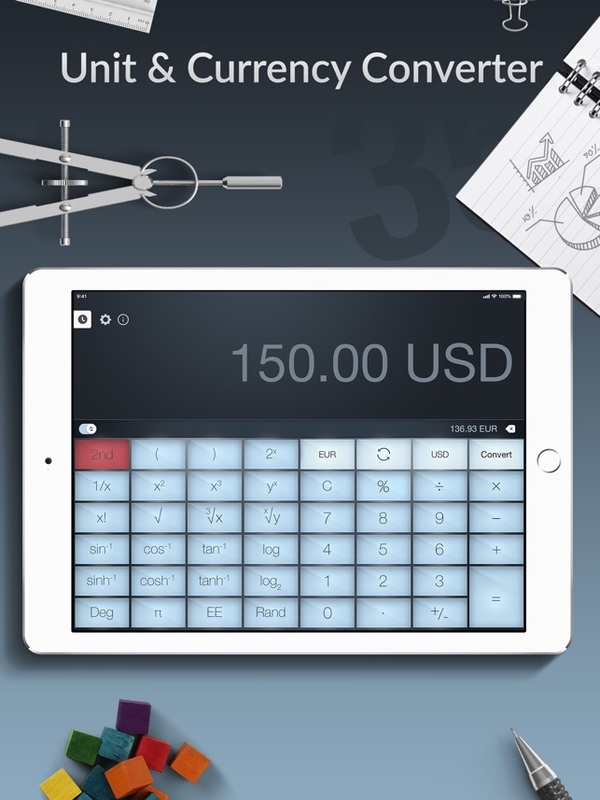 I have used this app for years, and it was one of the first apps I downloaded after getting my first iPad long ago (why Apple iPhones have a native built in Calculator App but the iPad does not makes no sense to me, and I Love all things Apple). The ads before were annoying but the app was still usable. However now there are full screen ads that you cannot immediately exit to use calculator, which is beyond infuriating. I understand when that happens if I choose to watch a video ad while playing a game app in exchange for an in game reward, but being forced to watch a full screen ad video which prevents me from doing some math on the calculator when I need a quick answer is so annoying I immediately looked for an option to upgrade to remove ads (which actually doesn't upgrade THIS app it downloads the paid version [different app, different app icon, same developer]), then I deleted this "free" version. Just do yourself a favor and buy the paid version (which I really like and I paid $0.99 for USD) and don't bother with this "free" version which is no longer useful when you need the calculator to work at that moment. Calculator With Ads. LOTS of ads. Yeah, it’s a calculator and has scientific modes and the ability to convert currencies. You have all kinds of nifty backgrounds to choose from. So that’s cool and I would give it a higher rating if I could just leave it at that. But it’s the ads. Yeah, I get it’s a free tool and you gotta pay your developers somehow. Why can’t there just be a perpetual banner at the top or at the bottom? I don’t have issue with the ads themselves, but I DO have issue with each ad taking up the entire screen. I happily use lots of free apps that have some sort of ad banner. But see, I can still *use* the app! Ya’ll are missing the point. I think it’s safe to say all the other users that have complained about the ads aren’t necessarily complaining that the ads exist. It’s how they’re presented and how it hinders the usability and, consequently, users’ satisfaction with the app. Thank you for reaching out. It's important for us to know which advertisements are found annoying by our users. Could you please share screenshots of those to support@apalon.com ? Thank you so much in advance! Get the full version with no ads!